This workshop is a great way to reset after the Thanksgiving holiday. Sound is the first sense we perceive in the womb and the last as we leave our bodies. 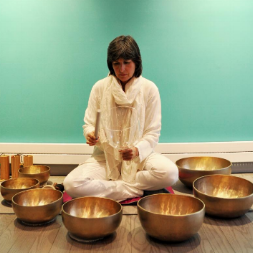 The sound vibrations of multiple Tibetan Singing Bowls release toxins on a physical, emotional and spiritual level. Since our bodies are made of 70% water, which is a great conductor of energy, everyday stresses and worries will melt away effortlessly. The bowls will be played close to, and sometimes on the body for deeper healing.